I love little quotes like this; nuggets of wisdom that I can identify with somehow. This particular quote was posted by one of the mums on the bereaved mummies thread tonight; it is printed inside a special notebook she has recently bought. This quote reminds me of a poem I wrote all about colours; what colours and life mean to me now. Many have probably read on facebook before, but I’m going to share it again. I struggle to find the sparkle, Since Anabelle flew away. But now the grey has descended, And tears are always on the brink. Full of beautiful rainbows, Until the day I was told. How do I find the gold and sparkle? How do I fight the grey? Find the strength to carry on, To find new pink or blue one day. The entire colour is now in heaven, My beauty Belle took it with her. Highlighting the fading colour in me, Anabelle and I are never really apart. She remains forever with me, Restoring the colours is now our goal. It’s the red that keeps me going, Without it, I would not be. Weddings and circles and angels, Shining bright in the sky for miles. And to especially find my sparkle, For my Anabelle, my precious gem. I wrote this poem at the end of August, 9 weeks after Anabelle was born. I felt I was drowning in grief, like I couldn’t surface from it at all, when I wrote this I was very nearly completely crushed. I still have days like that, weeks, most of December has felt that way. A lot of the questions I still don’t know how to answer – apart from surviving one day at a time. But I’m understanding more about the colours again. The little rainbows that pop up and brighten the soul. Everytime somebody remembers Anabelle, the people; virtual and real, who’ve been so thoughtful, generous and kind, it all contributes to the rainbows in our lives again. I know it is all a romantic notion really, speaking metaphorically like this, maybe it is the late hour when I should really be asleep. But reading back on the poem it is not just a tiny little pink that remains with me – pink and Anabelle completely fills me! As I’ve said it has been a very pink Christmas. Tonight something else was added to Anabelle’s tree. 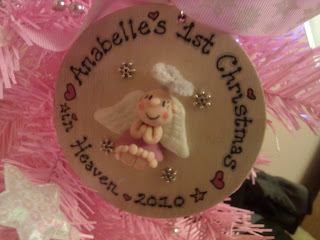 A beautiful wooden decoration, a cute little angel on it and glossed with “Anabelle’s 1st Christmas in heaven, 2010” painted onto it. Some lovely friends have had it made for her this Christmas, for her first Christmas, along with a wall plaque with her full name, date of birth and a poem about our angel girl painted on. It is these moments that add the colour and the sparkle back in. As always, it is including Anabelle in our lives in everything. Anabelle is our sparkle.